A Mountain Walked is an oversize anthology with almost 700 pages. S.T. Joshi has selected the best of the reprinted Cthulhu Mythos stories and combined them with over a dozen new works written just for this anthology. This book has over 25 stories, including new stories by Joseph S. Pulver, Sr., Donald Tyson, Cody Goodfellow, Caitlín R. Kiernan, Jonathan Thomas, Laird Barron, Michael Shea, Patrick McGrath, Mark Samuels, Gemma Files, and others. The book also has new artwork by David Ho, John Kenn Mortensen, Drazen Kozjan, Denis Tiani, and Thomas Ott. The edition is limited to 500 copies for sale. Each copy is signed by Thomas Ligotti, T.E.D. Klein, Laird Barron, Caitlín R. Kiernan, and many others. The signature pages are signed by 25 people and went halfway around the world for signatures. The book is 692 pages. There are several pages of full color artwork, too. The book is oversize as well, measuring over 7 × 11 inches tall. The book comes in its own clothbound slipcase and has a stunning full color dustjacket by David Ho and the usual goodies: image on the front board, ribbon marker, and head and tail bands in a gorgeous cloth bound Smyth-sewn book. This landmark anthology will surely be known as a classic in its field. Although most of the living contributors signed the book, Michael Shea passed on before the pages reached him. Writers who did not sign the book include Neil Gaiman, T.C. Boyle, and Mark Samuels. Note: This title will be shipping mid to late August, 2014. Limited to 500 copies, each signed by over 20 contributors. New stories by Caitlín R. Kiernan, Patrick McGrath, Gemma Files, Michael Shea, and many others. 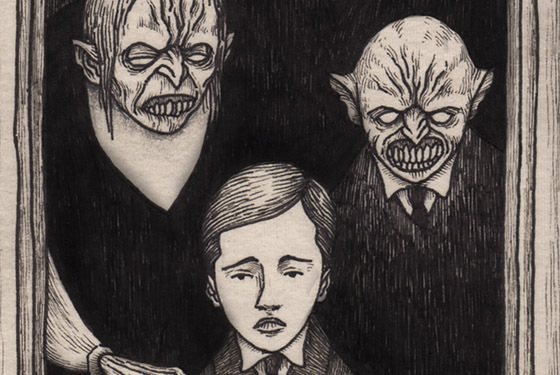 New artwork by David Ho, John Kenn Mortensen, and Thomas Ott. Oversize format, full cloth binding, ribbon marker.